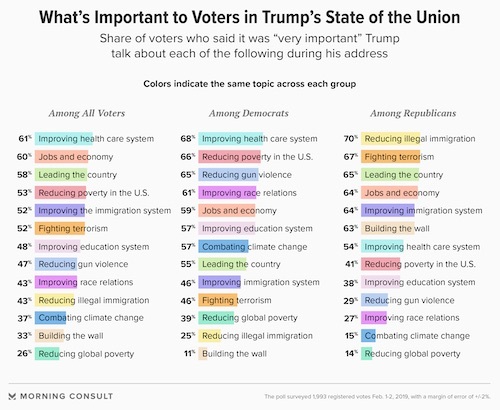 More than six-in-ten of voters want Donald Trump to talk about “improving healthcare system” and “jobs and economy” during tomorrow’s State of the Union address, while only third want to hear about his wall across the southern border. The Trump Wall ranks 12th of 13 subject categories, according to a Morning Consult survey released today. It trailed healthcare, which was cited as “very important” by 61 percent of voters, jobs/economy (60%), “leading the country” (58%), “reducing poverty in the US” (53%), “improving the immigration system” (52%), “fighting terrorism” (52%), “improving the education system” (48%), “reducing gun violence” (47%), “improving race relations” (43%), “reducing illegal immigration” (43 percent), “combatting climate change” (37 percent). “Building the wall” did edge “reducing global poverty” (26%). Seventy percent of Republicans make “reducing illegal immigration” their top issue. The Wall ranks No. 6 with 63 percent. Democrats put the wall (11 percent) on the bottom of their list of priorities. Improving healthcare is the No. 1 issue for Democrats at 68 percent.